Lewis Black signs Me of Little Faith. Event location: Largo at the Coronet, 366 N. La Cienega Blvd. Lewis Black , Me of Little Faith. From the hilarious Daily Show regular and bestselling author comes a ferociously funny exploration of religion and faith. Lewis Black reads from Me of Little Faith. Lewis Black will appear at BEA's Saturday night benefit on behalf of his new book, Me of Little Faith. Me of Little Faith is a ferociously funny exploration of religion and faith in which he examines how the rules and constraints of religion have affected his life and the lives of us all. His hilarious experiences with rabbis, Mormons, gurus, psychics, and even the joy of a perfect round of golf give Mr. Black the chance to expound upon what we believe and why — in the language of a shock jock and with the heart of an iconoclast. 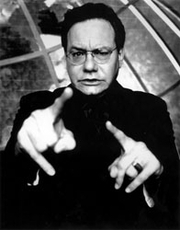 Lewis Black is currently considered a "single author." If one or more works are by a distinct, homonymous authors, go ahead and split the author. Lewis Black is composed of 2 names. You can examine and separate out names.